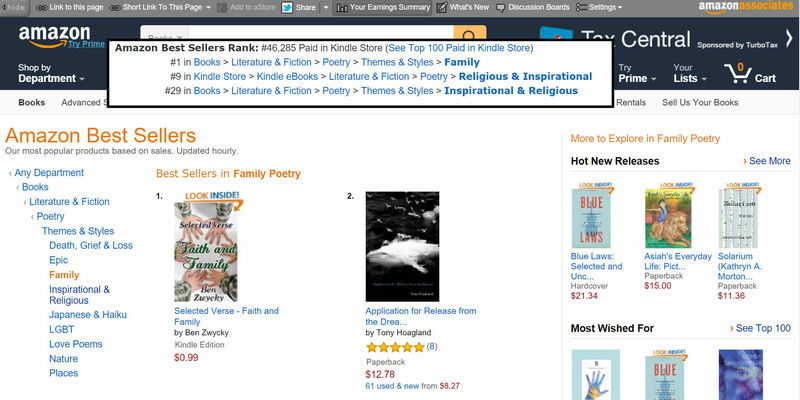 Selected Verse – Faith and Family currently No.1 in Family Poetry on Amazon! Thanks to the awesome influx of people visiting here from scifiwright and elsewhere (obliterating my daily traffic records) and buying up my books on sale, Selected Verse: Faith and Family has now reached the No. 1 spot for Family-themed poetry, and no. 9 in Religious and Inspirational Poetry ebooks at Amazon. I know this probably won’t last long, given how quickly these rankings can change, but I thought this moment worthy of recording for posterity. Family poetry is a surprisingly small category, let’s see if we can climb any higher in the bigger categories. This entry was posted in Announcements, Beyond the Mist, Nobility Among Us, Poetry and tagged Beyond the Mist, no.1, Nobility Among Us, ranking, Selected Verse by Ben Zwycky. Bookmark the permalink.